Phillies prospect Cornelius Randolph is out to prove he was worthy of a first round pick. 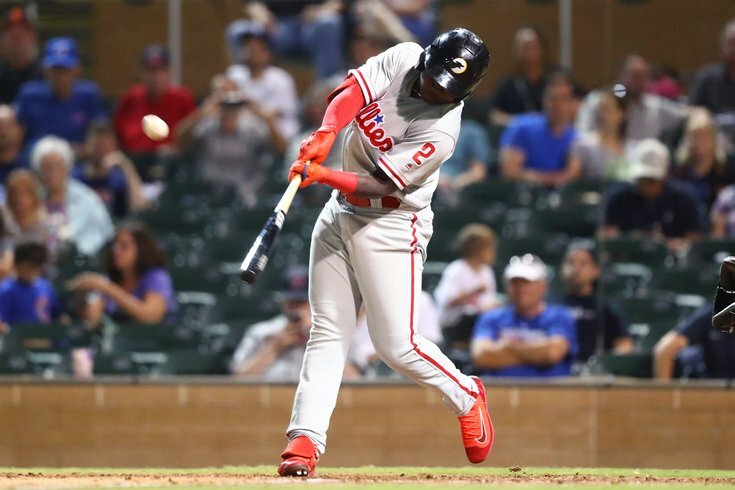 As we check in on the Phillies top prospects, and identify them as either being hot, or not, it's important for Phillies fans to keep an eye on the young talent playing in the minor league system. With trade rumors abound and the Phils expected to be buyers as the July 31 trade deadline approaches, there's a good chance the team decides to part with some of the following players as a means to acquiring veteran bats and arms and push for a playoff spot. Medina is the Phillies No. 2 prospect and he's playing like it. The 21-year-old hasn't lost a decision since April 19 and is 7-2 with a 3.99 ERA this season. Over his last 10 starts he's lowered his 2018 ERA by six runs. The Phillies' first rounder from 2017 has been maintaining his solid play, using two three-hit games over the last week to keep his batting average at .297 for the season. He has 19 extra base hits and 35 RBI through 67 games in Clearwater. The 22-year-old hurler has been mentioned as a high-middle of the pack prospect who may be traded in a deal netting the Phillies a big name (like Manny Machado) but perhaps the Phils may want to keep him around. On June 7th he went eight innings with just one run scoring. He followed that with a seven-inning shutout performance five days later. In all he's 5-3 with a 1.73 ERA in Triple-A. At 24, he is nearing the end of his "prospect" status but saw a string of seven straight wins end with two quality start losses this month. Irvin is still 8-3 with a 2.61 ERA this season and a prime candidate to be called up in the instance of an injury to a Phils' starter. One of the Phillies' top 10 prospects, Romero has won two of his last three starts and has lowered his ERA by nearly four runs over his last 10 starts — a stretch that he's gone 5-2 during. He's also shown to be an innings eater, going at least six innings in eight of those starts. Romero's rotation-mate and fellow top-10-prospect Suarez has been on fire himself, winning his two most recent decisions while sporting a 1.91 ERA over his last 10 starts. The 2016 first overall pick has found his groove, driving in 10 RBI over his last 10 games whole raising his batting average by almost 50 points during that span. Eshelman, acquired in the Ken Giles trade three years ago, was a revelation last year going 10-3 with a 2.23 ERA in Double-and Triple-A. This year, not so much. The 24-year old is mired in a terrible slump having lost four straight decisions with a 6.48 ERA in his last 10 appearances. The 2015 first round pick Philadelphia had high hopes for isn't faring too well in the high-level minors. On the season he's hitting .192 and has mustered just seven hits in his last 33 at-bats. He is just 21 and has lots of time to grow, as he was selected from high school, but his production is not encouraging. Ortiz is one of the few top 10 prospects on the "not hot" list as the right fielder continues to struggle in low-A ball. At just 19, the teenager can be excused for his lack of production in his first full season as a professional ballplayer — but his .162 average over the last week and a half is a bad sign. A second slumping top-10 hitter, Gamboa is just 20 but out of his element in Clearwater right now. He is hitting .158 over his last 10 games and .255 for the season.